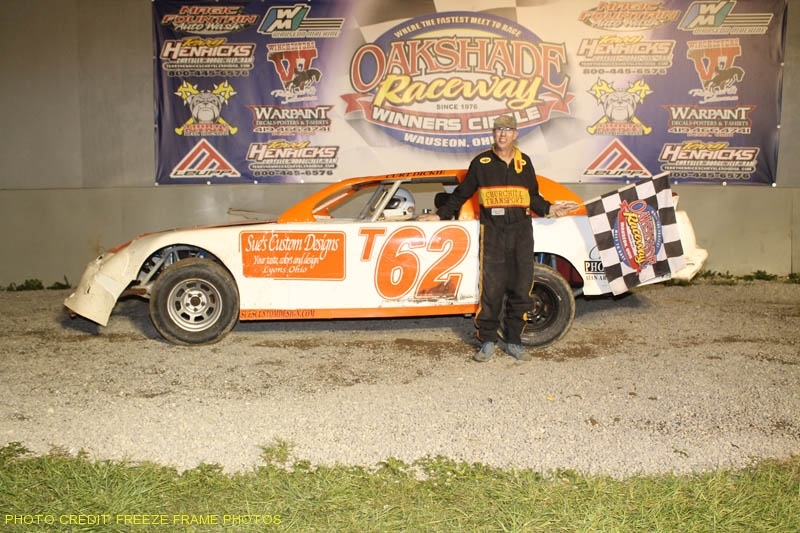 Rody Schroyer captured the 2008 Oakshade Raceway Late Model Championship last weekend after a season without a feature win. That changed Saturday night as Schroyer claimed the American Late Model Series Feature win in a spectacular three-wide photo finish. Kevin Reeve jumped out to the early lead in the 30-lap feature event after starting on the outside of the front row. Devin Shiels spin on lap four was the first of a series of caution flags that held the race on that lap. Herb Reich’s spin while running second and Rick Delong and Ronnie Perrine Jr. making contact while both drivers were in the top five were just a couple of those numerous cautions. Ky Harper found himself in second once the green flag flew for another lap, but that was all that could be completed before another yellow when Harper smacked the backstretch wall and broke something in the car resulting in a spin at the end of the backstretch. That moved Brian Ruhlman, the ALMS point leader up to second behind Reeve. Ruhlman made an initial charge on Reeve for the lead after the restart, but Reeve fought him off. A few laps later Ruhlman once again pressured for the lead on the outside and took command on lap 13. One lap later, Reeve’s hopes of a decent finish were dashed after he spun and brought out another yellow forcing him to restart at the rear. Finally, after a whole slew of cautions early in the race, a long green flag run began. Rody Schroyer started 16th and worked his way up to second by the second half of the race. Ruhlman had opened up a pretty sizable lead, but Schroyer chipped away at it lap after lap until finally catching him with just a couple laps remaining. Also sneaking up on the leaders was the 18 car of Rusty Seaver who quickly closed in to make it a three-car battle for the lead on the final lap. Ruhlman, Schroyer and Seaver battled three abreast on that final lap as they came up on some slower traffic coming out of the final corner. Schroyer went down low. Ruhlman found room up high and Seaver was in the middle just looking for a spot to go with the slower traffic ahead. At the line, Schroyer and Ruhlman were almost dead even with Seaver back just a bit, but it was Schroyer finally picking up his first win of the season by no more than an inch or two after starting deep in the field. A very humble Brian Ruhlman settled for second which will increase his point lead in the ALMS standings with just a couple races remaining over Rusty Schlenk who finished fourth. Rusty Seaver was a close third with Schlenk and Curtis Roberts rounding out the rest off the top five finishers. After the race, Schroyer was presented with a check for $2000 for the ALMS Feature win and he announced his possible retirement after this season as he will be without a ride next year even after winning the Oakshade point championship. A couple other noteworthy UMP Late Model veterans also announced that they were hanging up their racing helmets after this season. No longer will fans see the likes of Kris Patterson and Hillard Miller on a regular basis marking an end of an era at Oakshade Raceway after many great years of racing. Brian Fisher tried to make it two UMP Sportsman Feature wins in a row on Saturday night after taking the lead from Randy Franks on the second lap. Oakshade UMP Sportsman point leader Mike Jessen closed in on Fisher and the two drivers put on a heck of a side by side battle for the lead with Jessen finally closing the deal on lap 11. A late spin by Trevor Buter set up a two-lap race to the finish giving Fisher one last shot at retaking the lead. Jessen held on to pick the win which slightly padded his point lead over Fisher who finished second. Matt Lindsey earned the Ruhlman Race Cars Hard Charger Award, gaining nine positions to finish third ahead of Rusty Smith and Bruce Stuart. A huge pile up marred the start of the UMP Bomber A Main and resulted in a complete restart. Among the cars involved were Billy Brown, Karl Spoores, Ron Bloomfield Jr., Rick Dixon, Jamie Grochowski and Oakshade UMP Bomber point leader Jim Scout. Once things got going, Danny Hogrefe became the leader after starting on the pole, but had Chris Henry applying some heavy pressure. Henry entered the night just four points behind Scout in the point standings. Henry tried to get to the inside of Hogrefe coming off turn four and the two drivers made contact. Hogrefe continued on with the lead, but Henry began to fall back. Henry’s bid to take over the point lead suffered a major set back after he spun and brought a yellow flag that sent him to the rear for the restart. Hogrefe went on to lead the entire distance and picked up his first UMP Bomber A Main win of the year over Brett Miller, Dustin Sautter, Dan Shaffer and Curt Lancaster. Three drivers remain alive for the Oakshade UMP Bomber Championship with Chris Henry recovering enough after his spin to take an extremely slim three point lead over Jim Scout into the final weekend of point competition. Brett Miller sits just 38 points back in third. A terrifying incident in the UMP Hornet Feature brought out a lengthy red flag period on lap seven after 12-year-old Austin Peters’ car got turned toward the infield on the backstretch and then flipped over a couple times landing on its wheels. Peters appeared to be OK, but rescue crews took their time extricating him from the car and took him to a local hospital for further evaluation. Once racing resumed, Dylan Herman was the leader with Gabe Mueller in second. Mueller appeared to be a little slower coming up to speed on the restart which allowed Herman to open up a big enough advantage to pick up his fourth feature win of the year. Mueller hung on to finish second followed by Adam Noonan, Curtis Spurgeon and Tyler Line. Jeff Geis got his first feature win of the year in the UMP Bomber B Main after Jeff Grochowski led much of the race. Grochowski had opened up a lead over the rest of the field early but a couple of cautions kept the field tight with Geis eventually taking the lead after making the pass on the outside of Grochowski on lap seven. Grochowski finished second with Matt Rose third. Roscoe Stetton was fourth and Josh Scott who usually runs modifieds found his way to finish fifth. Tony Tolles led early in the UMP Bomber C Main until Bobby Hutchins took the lead a few laps later and began to pull away. Tolles eventually retired to the pits after falling back through the running order. Wauseon, Ohio’s Bobby Hutchins went on to the easy victory over Terry Rushlow, Jake Recker, Gregg Detray and Adam Lantz. Exciting point battles will be decided Saturday, September 6 which will be Season Championship night for the UMP Sportsman, UMP Bomber and UMP Hornet divisions at Oakshade Raceway. Gates open at 4pm with racing at 7pm. Only two weeks remain in the UMP Late Model point battle at Oakshade Raceway. On the line is a Rocket Chassis and $7,000 courtesy of Ruhlman Race Cars in Clark Lake, Michigan, Wyse Excavating in Wauseon, Ohio, Raceway Energy’s in Wauseon, Ohio, Harold and Sue Holland in Lyons, Ohio, Bill Ehrsam Concrete in Sylvania, Ohio, Don Williams Excavating in Wauseon, Ohio and Leo’s Metal & Wood in Clayton, Michigan. Seven drivers remain mathematically alive for the point championship, with the top four separated by less than 100 points. Rody Schroyer and Dusty Moore have remained in a heated battle atop the UMP Late Model point standings at Oakshade throughout the entire summer. Neither driver has been able to establish much of a point lead and currently Schroyer leads Moore by just 24 points. Casey Noonan has made his presence known, closing in to just 51 points behind Schroyer after posting his third UMP Late Model Feature win at Oakshade last weekend. Consistent runs for Zach Olger all summer have netted him 81 points back. With 95 points possible for a feature win, Kevin Reeve, Ronnie Perrine Jr. and Zac Davis all still have a very slim chance at the championship, but would need for the top drivers to experience a lot of bad luck the next two weeks. The Oakshade Raceway UMP Late Model Champion will be determined the night of Saturday, August 23 so the next couple weekends ought to make for some exciting racing action with such a tight point battle so late in the season.